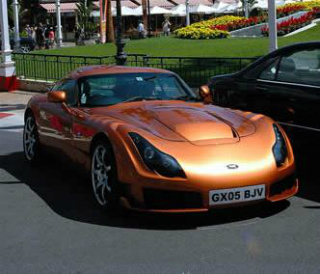 The prototype TVR Sagaris sports car was premiered at the 2003 Earl's Court Motor Show, whilst a year later, the pre-production model was introduced at the Birmingham Motor Show. Finally, in 2005, it was officially launched and was, in essence, designed as an endurance race car. It could be described as a racing version of the T350, and certainly looked like a road going race car. Based on the T350, it followed the company tradition of being built with no ABS, traction control, or even air bags. The road variant was powered by a 4 litre, TVR inline 6-cylinder, twin overhead cam, Speed Six engine, with four valves per cylinder, which developed 406 bhp at 7500 rpm, and 349 ft/lbs of torque at 5000 rpm. With a huge compression ratio of 12.2:1, and a five speed gearbox, it had a top speed of 185 mph, a 0-60 mph time of 3.7 secs, and a 0-100 mph time of 8.1 secs. 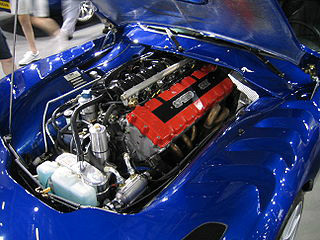 The 4 litre Speed Six engine, from the Tuscan S, was by now sufficiently developed to eliminate earlier problems. It was fitted with a front splitter, and a rear spoiler with aluminium supports. There were two bulges in the roofline designed for tall drivers wearing crash helmets and, in early models, the carbon fibre exhaust exited from the side in order to create maximum airflow around the rear diffuser. The body was constructed of glass reinforced plastic on a chassis with all round independent coil spring suspension, and Bilstein dampers that produced a firm ride. In 2006, the suspension was softened, and the ride height raised in order to reduce the incidence of the car bottoming out on bumpy roads. During its three years in production, the Sagaris was fitted with three different exhaust systems, which reduced output, initially from 406 bhp to 386 bhp, and then to 375 bhp. In order to increase grip and stability, it was fitted with a wider track than its predecessor, the T350. 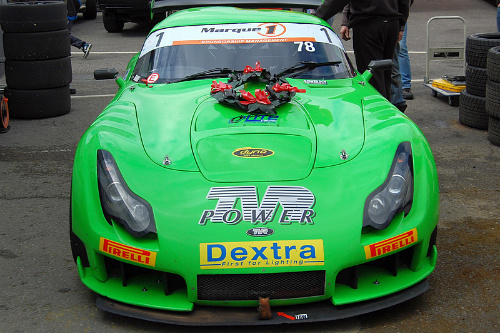 The only time that the car was raced was in the 2011 British Cup Series, when it used the chassis from the road variant, and was powered by a 4.5 litre, Supersport Speed Six engine, which developed 420 bhp. The Sagaris was the last model to be built, and the build quality was a marked improvement on earlier TVR's. The fact that the Sagaris sports car was not wind tunnel tested was reflected in the fact that, at 150 mph, the tailgate catch opened up. By 2006, total production was in the low hundreds, and it was probably the most thoroughly developed of all TVR's. A 2004-06 TVR Sagaris in good condition would command anything between £40,000/$64,000 and £50,000/$80,000 whist a really superb example could reach anything up to £65,000/$100,000.